Staff from Sitel’s Newcastle-upon-Tyne customer experience contact centre attended the Marie Curie hospice to donate a cheque for over £7,600, a fundraising initiative that sponsored the hospice’s running costs for the entire day. The donation, part of the hospice’s ‘Pay for a Day’ initiative, saw Sitel provide the £7,600 the hospice requires to maintain its operations on a day-to-day basis. 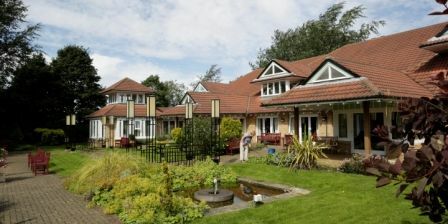 Newcastle’s Marie Curie Hospice cares for more than 1,000 patients and families each year, supporting people with terminal illnesses through specialist nursing care and a growing outpatient programme. As part of the sponsorship, Sitel staff attended the hospice on Wednesday 30th December, where hospice staff introduced them to some of the patients aided by six month long fundraising from Sitel. A group of Sitel employees visited the hospice to see how their fundraising was being put to good use and to witness first-hand the difference that it makes to the lives of patients and families. “Marie Curie is a vital organisation for terminally ill patients, providing important care and support patients require in their greatest hour of need. Staff at the Sitel Newcastle site were amazing during the entire fundraising period and we’re extremely proud to have reached our target of sponsoring the hospice running costs for a day. The Sitel team has been supporting local charities for more than two years and its donation this year alone already eclipses the total amount raised for the charity in 2014. The Marie Curie donation follows another mammoth six month fundraising effort in the first half of the year that raised over £6,000 for Tiny Lives, a charity which supports premature and sick new-born babies and their families on the Neonatal Unit at the Royal Victoria Infirmary (RVI) hospital. Be the first to comment on "Sitel contact centre staff Support Marie Curie Hospice"